We will supply and fit a new outside Tap With Check Valve up to 3 metres away from your cold mains water supply. 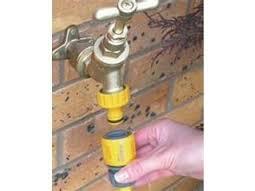 An outside tap is an important fitting to your house and if you've ever had one, but don't have one now, you'll agree. For cleaning your muddy shoes, your dogs, your car or watering your garden, you'll appreciate not having to keep going in and out of your house for some water when you have the convenience of an outside tap or stand pipe.